Numark Calamine Lotion - Soothes minor sunburn and other minor skin conditions. 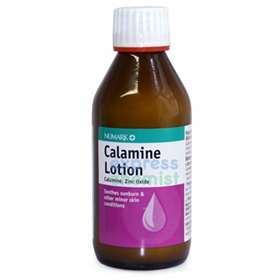 Calamine lotion is a mild astringent and antiseptic. Calamine lotions provide symptomatic relief from mild sunburn and other minor skin conditions. Apply Calamine Lotion with a pad of cotton wool to the affected skin as required. CALAMINE 15% W/V, ZINC OXIDE 5% W/V, BENTONITE, SODIUM CITRATE, GLYCEROL, PHENOL AND PURIFIED WATER.